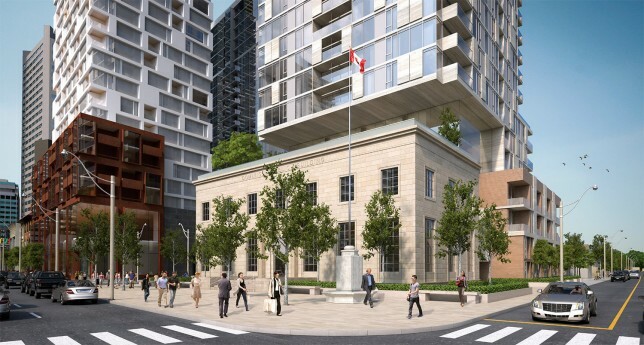 2384-2388 Yonge Street – Bousfields Inc.
Bousfields was engaged by Rockport Acquisitions Inc. to obtain approval for a new 27-storey building, situated to the rear of the 2-storey heritage building and the forecourt fronting Yonge Street. The project preserved the site’s various heritage elements and included the conservation, restoration and adaptive re-use the existing 2-storey portion of the Postal Station K heritage building and the refurbishment and visual expansion of the forecourt as a public square. The project includes 233 residential units, and 1,441 square metres of retail/commercial uses. Bousfields was responsible for the Planning Rationale, which set out the planning and urban design logic of the proposal and how it fits both its policy and physical contexts. The project was approved by the City.